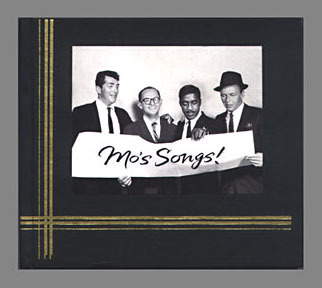 Shown is the promotional 6-CD mini album set produced by the artists and staff of Warner Brothers Records and presented to Mo Ostin at his retirement party in December 1994. Superiorly crafted in a custom photo-album style bound packaging, track one of the first disc is George's 5-minute tribute song "Mo". CDs include songs by George Harrison, John Lennon, The Travelling Wilbury's, REM, Madonna, Neil Young, Rod Stewart, Tiny Tim, Grateful Dead, Prince and many others. Rarely offered for sale as most of the copies went to employees / attendees of the farewell dinner. The 600 copies for employees were shrinkwrapped with a paper insert. 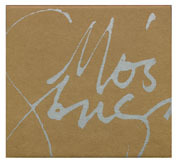 The personal copies for Mo and producer Jeff Gold were issued with a die-cut custom-printed outer cardboard box with the title in silver print. 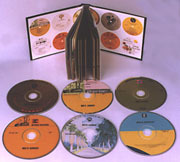 Above left, custom outer box, at right the CDs and packaging.  Click on either to enlarge.